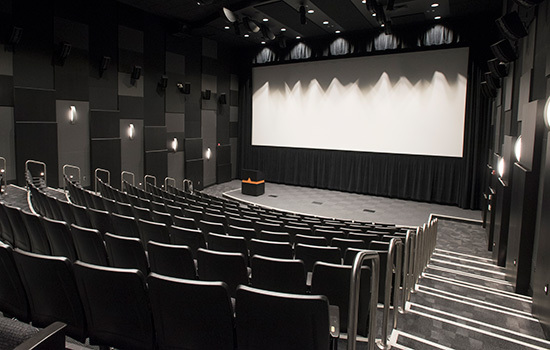 Wegmans Theater at RIT: A 180-seat theater with a projection booth and a cinema-quality audio/video system with 4K projection capabilities showcases academic and commercial productions and accommodates film showings, computer game events and guest speakers. Wegmans Theater at RIT—A 180-seat theater with a projection booth and a cinema-quality audio/video system with 4K projection capabilities showcases academic and commercial productions and accommodates film showings, computer game events and guest speakers. 2D animation lab—A 2D animation lab is one of five labs designed around core principles of constructionist educational models, or learning by doing. 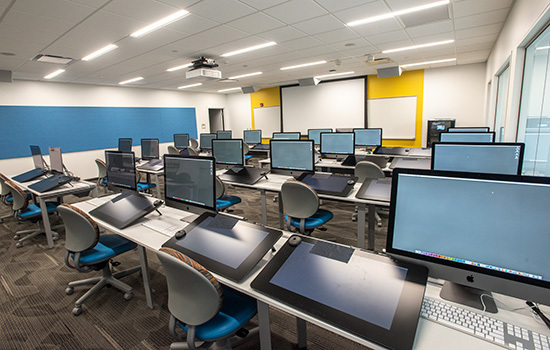 The labs, which include a 3D animation lab, facilitate education and hands-on interaction in film and animation and game design. The labs can also be used to support commercial and academic activities, research and experimental work, hackathons, game jams and more. Baselight Color Correction Suite—A tiered 50-seat color correction room doubles as a screening room complementing the various educational programs in this specialty field. Sound mixing facility—A tiered 40-seat audio-to-video mixing suite complete with mixing board, professional theater-quality audio systems, professional acoustics based on Dolby standards, and a voice-over/ isolation booth. 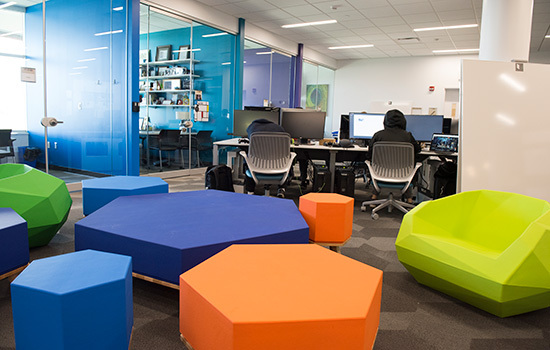 Innovation suite—An academic and commercial startup environment that combines student work spaces with high-end computing capability with academic and commercial offices. 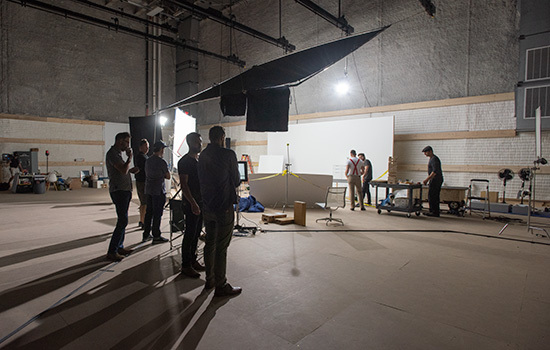 Sound stage—A 7,000-square-foot area that provides resources and space to student filmmakers. With storage, a control room and green room facilities in close proximity, the sound stage will be equipped for use with green screen and motion-capture capabilities and meets the requirements for the New York state film tax credit. Demo lounge—Designed for demos, client briefings and showcases. 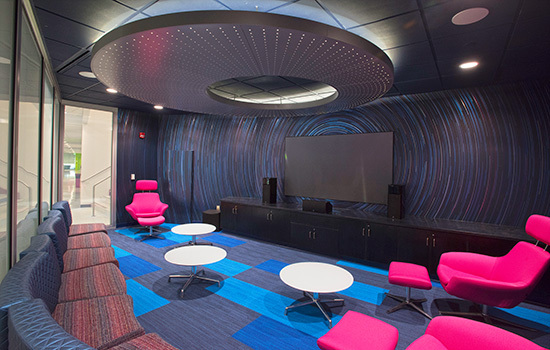 Includes a media wall, theater sound and lighting controls, virtual reality and augmented reality capability, and a workplace for clients, partners, guests and dignitaries to showcase digital media capabilities. Collaborative partner suite— Supports next-tier product development and collaborative work with external corporate partners and internal start-ups. 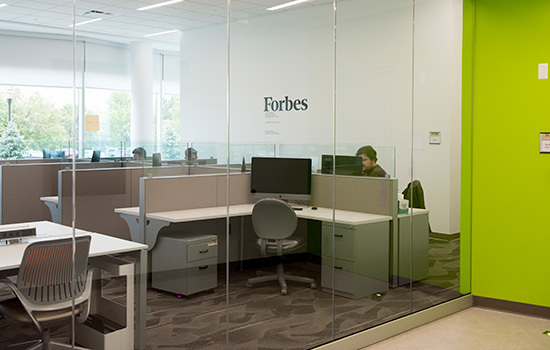 Forbes Media is the first in-residence company, and RIT students have already helped develop a new web platform that the company is rolling out for its writers. VR/AR Lab—Features an updated and expanded presence of the MAGIC VR/AR Lab, which serves the campus as a place for exploration and experimentation with virtual reality and augmented reality technologies, platforms and hardware.